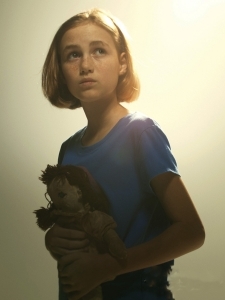 Sophia Peletier is a survivor of the zombie apocalypse and the daughter to Carol Peletier and Ed Peletier. During the initial outbreak, Carol, Ed and Sophia evacuated to Atlanta for safety, but end up joining a camp of survivors. While at the camp, Sophia sparked up a friendship with Carl Grimes and Eliza Morales. For more information, visit her page at The Walking Dead Wikia. Sophia is taken from the end of season one, the episode TS-19. She will get separated from her mother as they flee the CDC and end up at the Mansion. She's just a normal, human little girl. A doll given to her by her friend, Eliza. Sophia is a 12 year old girl with dirty blonde hair, freckles and brown eyes. Her PB is Madison Lintz. Sophia is especially close to her mother, probably even before the apocalypse and the child of an abusive father. She's lived in a constant state of fear, probably her entire life, but that's ramped up when the Walkers take over the world. She's seen crying during the series and comforted by her mother. Though we have little information about her before the series began, she seems to have been a fairly serious child. Events in her life probably lend themselves to her being emotionally labile and cynical. Her friendships with Eliza and Carl were very important to her, and she felt Eliza's loss deeply.